"The Future: Harnessing the Power of Open Source." From left to right: Chris DiBona, Brian Bouterse, Paul Jones. Photo by Elon University Relations photographer Kim Walker. Creative Commons rights. With Linux creator Red Hat just down the street from the Raleigh Convention Center, open source has been a huge part of the Web’s development, and the Future of Open Source Panel reiterated that fact. To show how far they’ve come, the panelists spoke about their first experiences with the Internet. Bouterse, the youngest of the panelists, first used the Internet as a 10-year-old and became fascinated by the “button with the little world” that took him outside of the AOL realm. DiBona first experienced the Internet through a Compuserve game and remembers arguing with a sevice provider for a faster connection. Jones has a unique story in which he had Tim Berners-Lee demonstrate his protocol from his rejected paper when he visited Jones at the University of North Carolina. The panelists also spoke about the start of their involvement in open source. DiBona said he became involved with Linux in college and that “it’s really nice being able to control your own destiny.” Similarly, Bouterse said the availability of the Red Hat Linux tools gave him the access and ability to become interested. On the other hand, Jones said he was given Unix by AT&T years ago, and then it was taken away. AT&T then issued a statement restricting any programmer who had seen Unix from working on other operating systems because they had been “mentally contaminated.” This restriction, of course, did not last very long. The panelists then evaluated the state of open source in its growth and development. DiBona said he’d put it “at the knee,” and Bouterse said it was somewhere in between a toddler and a teenager. Jones said the base ideas were good, but not enough projects “fork” and take a creative turn. Jones said strong intellectual property laws will continue to help the growth of open source because it will encourage people to create their own code rather than stealing from someone else. He compared open source to American literature in the country’s early days; publishers preferred to print British literature because it was not copyrighted or the copyright was not enforceable. 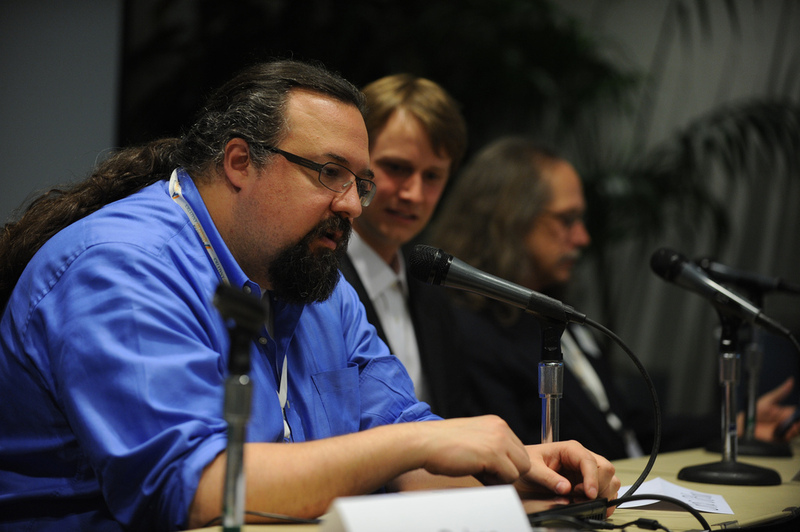 The panelists had differing views about the government’s role in open source. Bouterse said open source is the correct mechanism for transparency, while Jones emphasized the roles of procurement, bondable stock and availability, and drawing on subsidized intellectual endeavors. Jones takes it one step futher, asking the public to honor content creators by attributing their work to encourage them to keep contributing. “I wouldn’t want to live in a world without open source,” Bouterse said. 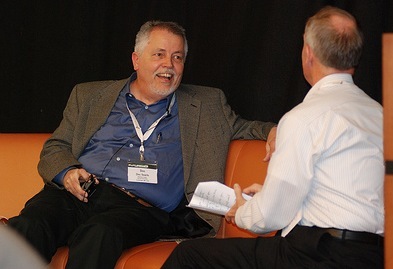 In the last session of the second day, Lee Rainie sat down with Doc Searls, the Linux Journal senior editor, and fellow at Harvard’s Berkman center. Searls is part of the Pew’s closest network, and has praised the Pew Research Center from early on. Throughout the interview, Searls continued to relate the Net to construction and geology. He sees the Internet as the foundation for web ‘construction’ sites. “Buildings come and go, but the geology doesn’t, and the geology is the Net,” Searls said. Rainie then moved to a question about the notion of property, and what the current world has wrong with its very definition. Searls explained value beyond the physical realm, and how morality can play a role in the creation of this value. He contrasted two morality principles: the exchange, where one item is traded for another; and the relationship, where there is no transaction taking place, and there is no price put on love. According to Searls, the Internet falls in the second category, where it is something so inherently generous, yet no transaction is taking place. Rainie challenged this generosity concept, and asked the normally optimistic Searls what worries him for the future. He discussed global warming prospects and the notion of running out of Earth’s vital elements. He compared our long-term state to the condition of ants with a hill on the sidewalk, metaphorically implying that eventually someone will step on (us). “I hope the Internet will help us see that,” he said. FutureWeb 2010 Conference, Raleigh, N.C., April 30, 1:30-3 p.m. Chair: Tom Rabon, executive vice president for corporate affairs for Red Hat. He has over 25 years of experience working in government and the private sector, including working with international governments to create opportunities in emerging markets such as China and South America. Rabon previously served as the vice president of Global Government Affairs at Lucent and the state vice president of Law and Government affairs at AT&T. Panel description: Many of the greatest innovations of the 21st century have been made possible by the movement toward broad-based participation and collaboration. Wikipedia, the Human Genome Project and Facebook are just a few examples of harnessing participation and transparency of process to deliver a successful outcome. As a vehicle for economic and social change, the power of open source is immeasurable in changing how people learn, how developers create and how companies do business. This panel will explore the future of open source and how society can unlock the value of information by sharing it. The panel will aim to specifically isolate the key challenges and opportunities in the looming future for open source and the Web and it will work to identify some specific action steps that can be taken today to work for a better tomorrow. Michael Tiemann, vice president of open source affairs for Red Hat. His pioneering open source work led to the creation of leading open source technologies and the first open source business mode. He is the co-founder of Cygnus Solutions, the first company to provide commercial support for open source software. Tiemann is the author of the GNU C++ compiler, the first native-code C++ compiler and debugger. Chris DiBona, open source and public programs manager for Google. DiBona and his team oversee projects like the Summer of Code, which works to oversee license compliance and supports the open source developer community. He also works with Google Moderator, the polling locations API. DiBona has an international reputation for promoting open source software and related methodologies. His personal blog can be found at http://dibona.com/. Brian Bouterse, research associate at the Secure Open Systems Initiative with NC State University and networking and systems specialist at The Friday Institute. 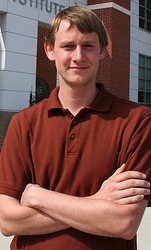 He has previously worked as an undergraduate teaching assistant at NC State University. Bouterse specializes in cloud services, networking and distributed computing. View his LinkedIn public profile at http://www.linkedin.com/pub/brian-bouterse/6/917/a11. For more information about FutureWeb 2010 panel discussions, featured panelists and more, click here to navigate to the FutureWeb site. To register for the conference, visit the FutureWeb registration page.